Pro-Morsi demonstrations took place in Cairo's Shubra and Nasr City, Giza's Mohandiseen and Haram, the coastal city of Alexandria, the Suez Canal city of Ismailia, Nile Delta’s Beheira, Damietta and Daqahlia, and Upper Egypt’s Assiut while anti-Brotherhood demonstrations carrying pictures of military chief General Abdel Fattah El-Sisi were also held in several cities. Violence has erupted at several of the demonstrations, with two protesters killed in clashes between pro- and anti-Brotherhood demonstrators in Damietta and Alexandria. The National Alliance to Support Legitimacy, led by the Muslim Brotherhood, had called for demonstrations to press for the reinstatement of ousted president Mohamed Morsi and other key demands. The numbers of protesters on Friday seem to be significantly lower than previous weeks. One person has reportedly been killed during clashes in Damietta's Kafr Bateekh after a pro-Morsi rally was attacked. Al-Ahram Arabic reports that the dead man, Ibrahim Selim, is a member of the Muslim Brotherhood. Dozens were reportedly injured in the incident. Scuffles also erupted outside Alexandria's Al-Qaed Ibrahim Mosque after noon prayers when local residents attacked dozens of pro-Morsi protesters. Stones were thrown back and forth between the groups, Al-Ahram Arabic news website reported. A pro-Morsi protester was also killed in clashes in Alexandria's Sidi Gaber district, which left several injured. According to Osama Abou El-Soud, head of the main university hospital, two protesters were taken to a nearby hospital after one was stabbed in the chest while the other sustained a gunshot wound, Aswat Masryia reported. Twenty-three MB supporters were arrested following the clashes in Egypt's second biggest city. Suez also witnessed clashes between Morsi supporters and opponents in Arbaeen Square where a demonstration was being held in support of the army. In Daqahlia’s Mansoura city, scuffles erupted when a pro-Morsi demonstration was attacked by unknown assailants. According to Al-Ahram Arabic website, the demonstration did not last more than ten minutes before it was attacked, leaving some protesters injured. Several anti-Brotherhood demonstrations carrying pictures of military chief General Abdel Fattah El-Sisi also took place, including in Cairo's Maadi district, Assiut and in Suez city. A nightly curfew, imposed daily at 11pm, begins at 7pm on Fridays to restrict the regular pro-Morsi protests. 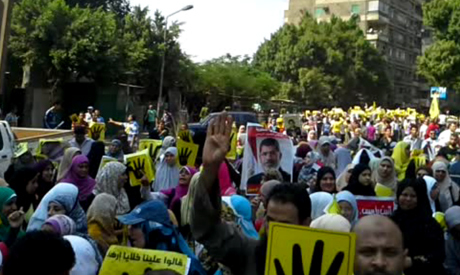 Demonstrations were also held this week on Tuesday, to mark two months since Morsi’s ouster on 3 July. The statement came after a Thursday bomb attack which targeted Interior Minister Mohamed Ibrahim. "The alliance stresses that it is against all acts of violence, even if they target those who commit crimes against the people, because we aim to uphold the state of law," read the statement. A security crackdown on pro-Morsi protest camps in Cairo on 14 August left hundreds of protesters dead and sparked days of intense violence nationwide. Since then, intermittent clashes have taken place between Morsi supporters, anti-Brotherhood civilians and security forces. In recent weeks many Brotherhood leaders and allies have been arrested and charged with a variety of offences related to inciting violence. I have no doubts that many of the anti-Islamist media outlets are funded by Israel. Notice, the vehemently-anti Palestinian rhetoric by these outlets. It is not pro and anti MB. Let us callt hings by their real name. The attackers of the protesters are violent army-paid thugs or Baltagiya. This the main tool of fascism in Egypt today.